We love unusual, beautiful and functional products and only offer pieces we love to cherish and be proud to display and use in our home. We source pottery of the finest and most beautiful from Boleslawiec a small town in Lower Silesia Poland. The area is rich in Stoneware clay and the pottery has evolved over centuries around its natural resources. With potter’s schools in existence since the 12th century, the town is known worldwide for its striking, robust everyday use pottery. Factories use the well known patterns such as the old Boleslawiec spot pattern and the pattern known in Poland as the mosquito pattern (Polkadot Lane naming this the fern pattern). These traditional patterns of cobalt blue, were stamped on using potatoes with patterns representing twigs, spots and peacock feathers, then glazed and fired to high temperatures. Today the patterns are sponged on with intricate unique pieces hand painted by artists. Each is a work of art with no two pieces being identical, with its great demand – unfortunately patterns and shapes are copied. Genuine pieces show the stamp ‘Hand made in Poland’ with the manufacturers logo on the bottom. We use the long established producers Ceramiczne Manufaktura and Ceramiczne Artystyczna supplying the bulk of our pottery we have on offer. Their pottery is known for its strength, functionality and simplicity of design and its pieces are loved and collected all over the world. We import only 1st quality products and the range includes everyday polkadot pieces of round teapots, mugs, butterdishes, oven dishes and more. All the pottery is safe to use up to a temperature of 280c in the Oven, Aga and is Microwave, Dishwasher and Freezer safe. 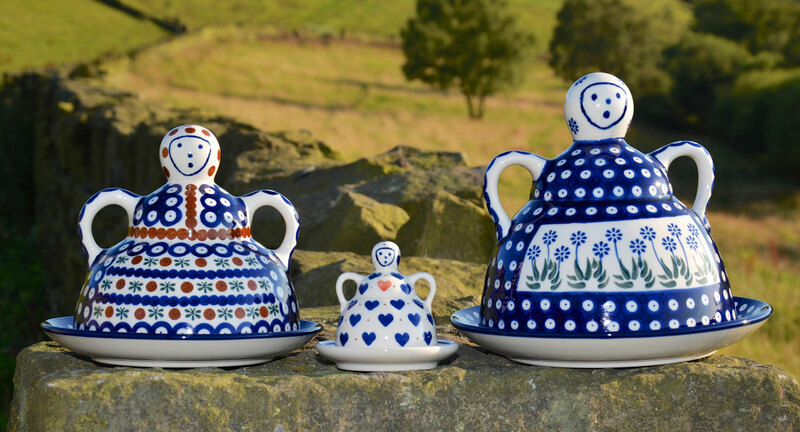 A contrast to the popular Boleslawiec spot and for those customers who love the strength of Boleslawiec Polish Stoneware pottery, wanting something different and quirkier, we have chosen 2 families. Ceramika Andy and Ceramika Millena provide us with Unique (Unikat) beautifully handcrafted signature (artist signed) pieces. Both families are long established having a distinct style of their own – priding themselves on the quality and functionality of their ceramics. We have on offer from Ceramika Andy and Ceramika Millena pieces hard to find anywhere else such as owl money boxes, chicken money boxes, honey pots, our famous buntin’s to make beautiful Yorkshire puddings a talking point and more. All pieces of Polish pottery produced in Boleslawiec are Stoneware, hand crafted and hand finished, fired twice to high temperatures with a final firing of at least 1250c. The shapes formed are either thrown by hand on a potter’s wheel or liquid clay is poured into a mould producing a ‘form’, which is dried and cleaned ready to be decorated. Small sea sponges are individually cut to stamp on the pattern and colour. The more elaborate designs are painted on using paint brushes and here the artists can express their creativity with whatever patterns they so desire. The piece is then hand dipped twice in a strong glaze which goes in for its long and final firing. The processes of production result in a smooth glaze with a hard wearing finish, which is extremely durable, cleans easily and is highly resistant to chipping and wear. Each piece is oven, microwave, dishwasher, Aga and freezer safe. It will withstand the hottest oven but it is not recommended to go from the extremes of the freezer to the oven or oven to freezer. The pattern remains vibrant and the glaze and pattern will not fade in the dishwasher. It holds its heat well when serving to the table, keeping food warm throughout the meal. It is beautiful whether it is a simple pattern or an elaborate pattern and when using this pottery you do not have to try – it does it for you ‘any occasion is a special occasion with Polish pottery’.